Mark Zuckerberg and Priscilla Chan have recently been spotted making a seemingly unplanned cameo appearance in a documentary for Chinese TV. 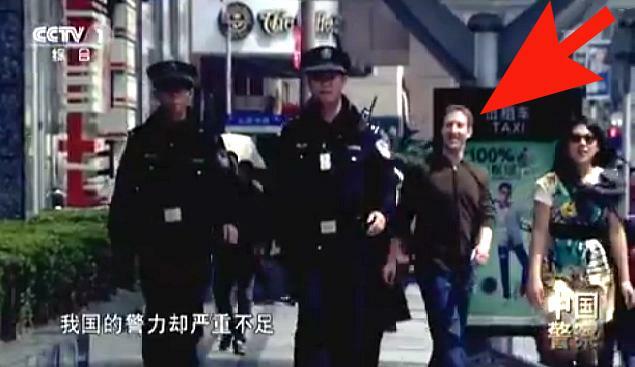 Filmed by Chinese Central Television, the Facebook co-founder and his wife are seen in an episode of Chinese Police walking behind two cops patrolling the streets of Shanghai. The short sequence (you can watch it below) has since become an Internet sensation thanks to word spreading on China’s popular Twitter-like site Sina Weibo. As Facebook-related news stories go, it’s certainly one of the odder ones. The footage of the pair, which lasts just a couple of seconds and comes shortly after a clip of an exploding mannequin, was reportedly filmed on March 27 when the pair were in the city enjoying a break. The Facebook boss, wearing his trademark hoodie, appears to have a big smile on his face in the video – possibly thinking about the billions of dollars he was going to make when his company went public. Had he known of the subsequent controversy that would come with the flotation, the grin might not have been quite so broad. When you think about it, Zuckerberg and Chan did pretty well to turn up in the documentary – especially considering that Shanghai has a population of more than 12 million people…..unless the whole thing was planned, of course.